When international air travelers arrive at airports and check into their flights, their passports are scanned by TSA agents. In many cases, these passport scans are stored in airport databases for months at a time. These scans are huge treasure troves of information that, if obtained unlawfully, could result in tens of thousands of stolen identities. No effective mechanism has been implemented to ensure that the passenger who checked into the airline is the same one getting on the plane. Studies show airport security personnel“ are only 85% accurate when matching travelers to their photo IDs. As a result, airports and airlines are vulnerable to terrorism and customs duty fraud. Veres anonymizes biometric data and binds it with a boarding pass identifier by writing them to a blockchain database. The result is a fully auditable database recording passenger checkpoint events. This improves security and introduces various economic benefits. 1) An airline’s boarding pass kiosk verifies a passenger’s identity and collects the their biometric data via a face scan or fingerprint. The kiosk uses an algorithm to analyze this data and creates a unique numeric string called a hash. 2) The hash and a unique boarding pass identifier are written to the airport security blockchain. It is important to note that neither the boarding pass identifier nor the hash contain personally identifiable information. 3) The passenger proceeds through routine airport checkpoints. 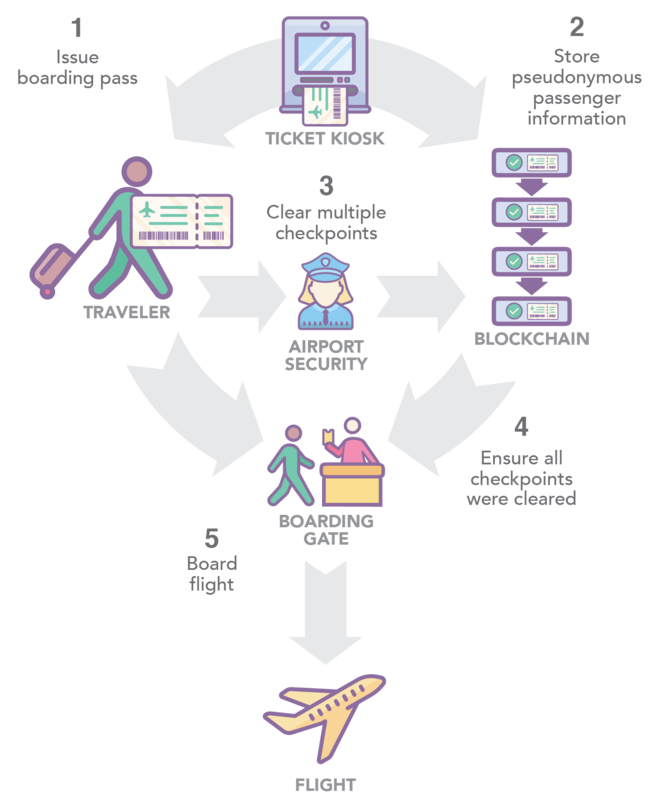 At each checkpoint, the same biometric scan is performed and software verifies that the resulting hash of the biometric scan matches, the boarding pass identifier matches, and each preceding checkpoint has been cleared in the proper order. 4) The boarding gate is the final checkpoint. The passenger’s boarding pass identifier, biometric data, and whether or not they have cleared all of the required checkpoints in the proper order is checked one last time. 5) If all of the checkpoints have been successfully cleared in the proper order the passenger is permitted to board the flight. Binding a boarding pass with biometric data dramatically increases the chance that the same person who checked in at the kiosk is the same person boarding the flight. Blockchain technology provides an immutable and auditable log of what each checkpoint software and/or personnel checked and when. This approach enables airports to allow international travelers to leave preclearance zones and know that those returning to the gate are the same ones that cleared security. This capability also allows any gate to serve international flights. Using a blockchain enables identity information to be captured and shared across borders without the need to store or communicate personally identifiable information. Using a pseudonymous biometric hash and boarding pass identifier enables the tracking of each individual without the need to store personally identifiable information.